Please take another look at the picture. We have all seen it so many times that perhaps it no longer has the impact it should on us. We need to be deeply grateful to those who went before who sacrificed so much for us, just because it was right thing to do. So let us think deeply and feel deeply and love deeply. There'll remain a distance between him and God!" The way has been given to us , not handed to us on the proverbial silver platter, rather on a red-hot platter containing our sweet and loving Guru Ji. What does our history tell us he did? He repeated Naam and praised God! When those hateful thoughts and feelings come up - and they do, of course - the simplest thing to do is jap naam, either out loud or silently. This can be done anywhere, at any time. Just remember the wonders of Vaheguru, Akaal Purakh, Ek Onkaar, whichever appeals most to you and repeat, "Vaheguru, Vaheguru, Vaheguru..." The power of Gurmantar can push everything else out of the way, especially those thoughts and feelings of anger and hatred. There are many methods of Naam-Jap. Use any or none. A very wise and beloved friend of mine known to me as Papa Ji told me that there is no wrong way to jap naam. Just do it! This is neither magic nor self-hypnosis. Mindless repetition is useless and unSikh. It must be done consciously. In time, the love and peace will come to me, and I feel a little less separated from God. It is such a Sikh thing to do! The extraordinary Man who gave Sikhi two of its greatest gifts ... the Guru Granth and the Harmandar Sahib ... was in the prime of his life, a mere 39 years old, when his spiritual activities were deemed a threat to institutionalized religion by the ruler of the land. Refusing to waver from his faith, he was tortured until his body succumbed. 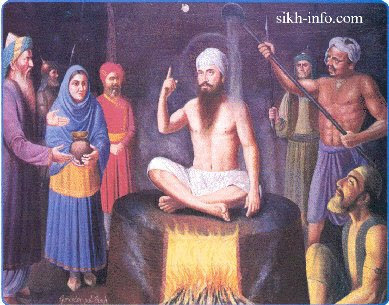 His name is Arjan, our Fifth Guru, on whose shoulders stands much of Sikhi as we know it today. So, how do Sikhs commemorate his martyrdom? We don't beat our breasts. We don't wear hair shirts. We don't mourn. We don't lament. We don't rail against the forces of evil and brandish recriminations. But here's what we indeed do. We take some water. We add milk to it. And sugar. We then add gulab jal (rose-water) to give it flavour. We add chunks of ice to chill the beverage. Then, on the day marking the great martyrdom - invariably, the peak of the sub-continental summer, when temperatures bake in the Celsius forties - we set up stalls in every village, and town, and city. In every neighbourhood. We serve the refreshing libation to all passers-by. Free. Nay, many do better. Volunteers spill into the streets and gently stop the traffic and offer the kacchi lassi to those in cars and buses, rickshaws and tempos ... and ask for nothing in return. It brings no medals. No awards. No certificates. No media coverage. It's done for the sheer joy of it all. Year after year. Century after century. 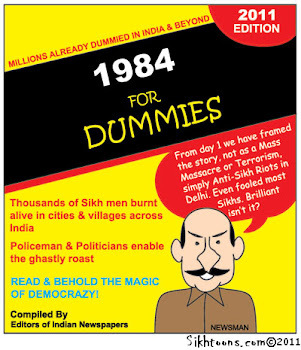 This is how we, the Sikhs, celebrate - yeah, CELEBRATE! - the great sacrifice. It is simple. 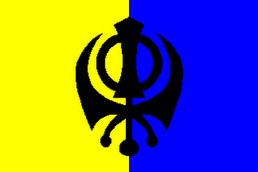 It captures everything that Sikhi offers. There is no greater glory. This is how we remember this Mard Agamra - The Ideal Person - who did so much that we enjoy today. 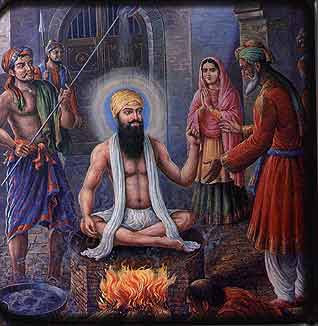 Arjan was born at Goindval in 1563 to Bhai Jetha (who later came to be known as Guru Ram Das, the fourth Nanak) and Bibi Bhani. Though the "baby" of the family, he was deeply spiritual. Impressed by his true piety, Guru Ram Das named him the next Guru. He took the mantle at the young age of 18, when the former shed his mortal coil. Guru Arjan was a walking institution: in the ensuing 23 years of his life, he led the still-nascent community into maturity. He began and completed the construction of the Harmandar Sahib in the middle of the Amritsar sarovar. At the commencement of the project, he did something revolutionary: he asked Sayeen Mian Meer, a respected Sufi from Lahore, to lay the cornerstones of the new structure. Arjan also started and took to fruition the monumental task of compiling the authentic compositions of the preceding Gurus and fifteen Bhagats whose spirituality was in consonance with that of the Gurus. 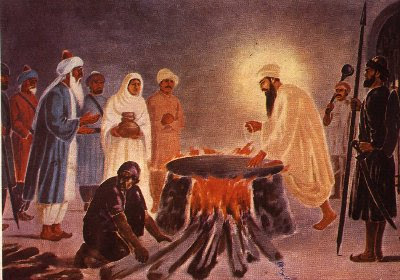 The investiture of the new Granth in the new Harmandar took place in 1604, and Baba Buddha ji became the chief steward. Arjan was a poet, a linguist, and a musician, par excellence. He combined his talents not only in compiling the bani, but ultimately became its biggest contributor through as many as two thousand verses, which now comprise one-third of the Guru Granth Sahib. He came to be known as Sacha Padshah, the True King, to his contemporaries. All of this did not go well with the Mughal Emperor, Jahangir, and the clerics that surrounded him. "So many of the simple-minded Hindus, nay, many foolish Muslims too, have been fascinated by the Guru's ways and teaching. For many years, the thought had been presenting itself to my mind that either I should put an end to this false traffic, or he be brought into the fold of Islam." Ultimately, Jahangir had Arjan taken prisoner and presented with the choice in Lahore. He was tortured over the course of several days, with hot plates, burning sand, and boiling water. A Hindu official, Chandu, encouraged the Mughal. On the other hand, Sayeen Mian Mir offered to intervene. The Guru declined. With "Sweet is Thy Will, O Lord ..." on his lips, he was taken to the River Ravi nearby. "A dip in the river's cold water was more than the blistered body could bear", writes historian Gurbachan Singh Talib. "Wrapped in meditation, the Guru peacefully passed away." A Jesuit, Father Jerome Xavier, who witnessed all these goings-on, in a letter he wrote from Lahore on September 25, 1606, says: "In that way their good Pope died, overwhelmed by the sufferings, torments, and dishonours." So was the Guru's light merged with the Divine. But the ringing of the hunter's bell. Even as the chatrik never fails to utter his cry. With equanimity in holy company. May I be a sacrifice unto this Guru Arjan!